Time for a Sizzler flashback? 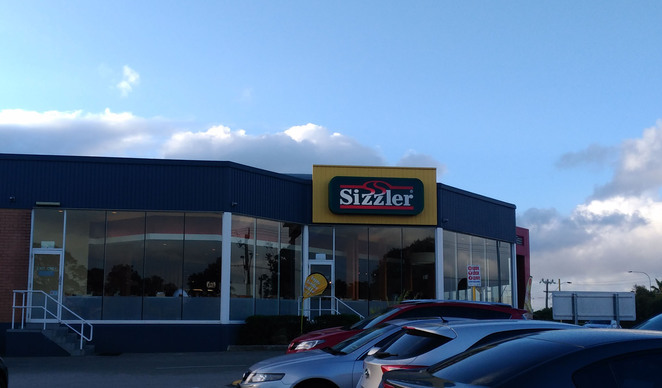 I had a little childhood flashback the other day and it got me curious- does Sizzler still exist? I mean, back in the 90s it was like a rite of passage! After a quick bit of research I uncovered four Sizzler restaurants still operating in Perth. I made a spur of the moment decision, I was going to show my kids what it was all about! So we headed to the Innaloo restaurant. Innaloo Sizzler is located in a cinema complex, so there is plenty of parking. It was spacious, clean, and with a large wall of windows letting in natural light. The staff were organised and friendly... off to a good start! Don't bother ringing ahead because Sizzler don't take bookings. It's a pretty simple system- first in, first served. Not surprisingly, there was already a decent crowd at 5pm on a Sunday night. 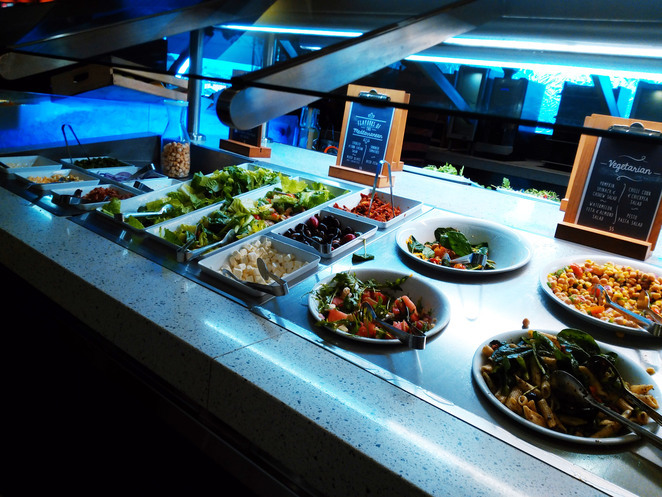 The menu is displayed on large boards in the foyer, where you can order the standard salad bar or add a range of meals, snacks, drinks and add-ons. Then you'll then be seated by a staff member. While special orders will be delivered to your table, the rest is up to you! If you're rolling your eyes at me right now, then trust me when I say Sizzler has changed since the 90's. No, it's not the place you'd go for a hot date, and yes, it's still all about families. But gone is the fried fare sweating in bain-maries, and in its place is something way better than I remember. The standard order of the 'salad bar' includes a pretty impressive array of fresh and healthy salads, as well as soups, pasta, fruit and dessert. If you are vegetarian or gluten intolerant, you won't have any trouble finding something to suit. When I say salad I mean a LOT of salad. Just a few on offer include: a make-your-own (MYO) caesar bar; pumpkin, cashew & spinach; coleslaw; cobb; spicy chicken cous cous; seafood ... should I go on? There's also a MYO nachos bar, pasta bolognese, wedges, potato bake and three soups. You can also choose to order grills and other food. For example, the 200gm rump steak (which was cooked medium rare as requested) is $29.50. Because this comes with the salad bar you're effectively getting your rump for $3.55. There are other options like ribs, burgers and more. The dessert bar had a pretty tasty apple crumble. And then I saw it. The same dessert bowls from my childhood. The familiar soft serve machine- chocolate or vanilla? All sorts of crazy concoctions of sprinkles and sauces. Ok, it's true, some things don't change. And that is just fine. Yes, the Sizzler experience can be gluttonous, but it needn't be. With so many healthy foods on offer, which are clearly made fresh, it can be whatever you make it. Dinner pricing for the salad bar (which includes your soup, pasta and dessert) is $25.95 for adults, $5.95-9.95 for children (depending on the age), and under 4's are free with an adult. I hear that all Sizzler restaurants are now company owned and operated (no franchisees) so the experience should be similar at all locations. However, if you're up to re-visit Sizzler I reckon Innaloo is the place to go. Hypercolour t-shirts and bike shorts optional. Sizzler has gone down greatly in the last few years. When any dish runs out on the salad bar you have to ask for it to be refilled. The quality of the food is now far from what it used to be and no staff to help you at the salad bar when dishes run out. I would be interested to know if you received a free meal for your great comments!!! Hardly worth the time and effort.